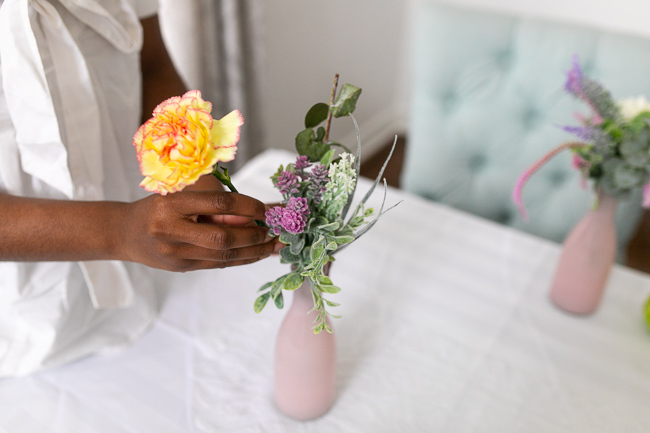 Bring spring indoors with this simple, yet elegant DIY spring centerpiece on the cheap. Using Dollar Tree and sale items I was able to achieve this expensive looking centerpiece for much less. 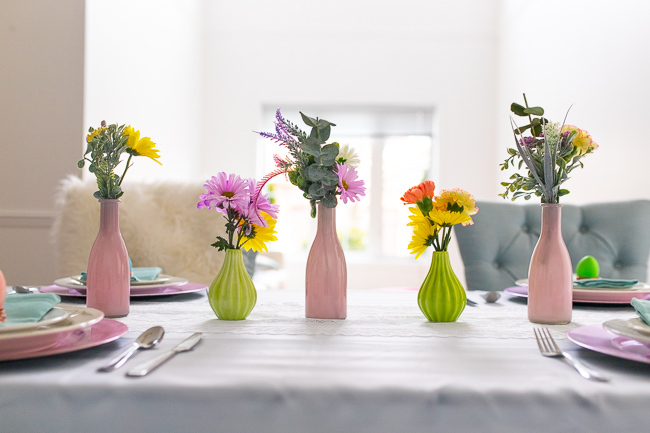 This simple DIY spring centerpiece was perfect for my minimalistic Easter table setting post, 3 Easy DIY Easter table setting ideas, you’ll love! It’s also great for any spring and summer events , weddings or spring home decor. 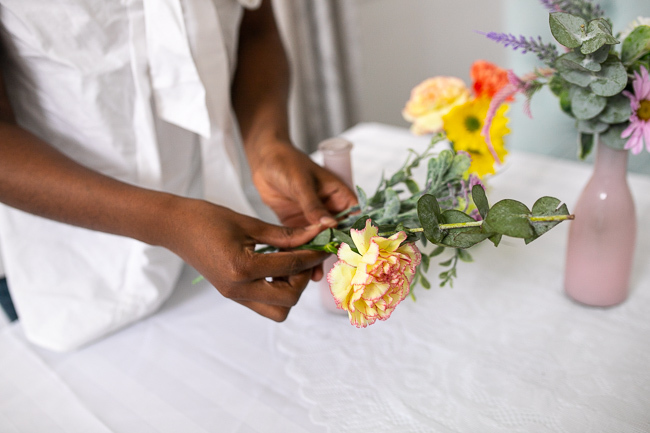 What makes this DIY super cheap is the fact that not all the flowers are real which can cut the cost. Real flowers can be expensive and do not last long. However, they look beautiful. Therefore, I decided to mix my Dollar tree faux lavender branches with real flowers from Walmart. Making the faux flowers undetectable unless you really look closely at them. Next, find some awesome spring-like mini vases to put your flower arrangements in. These vases are tiny so each vase only needs a few branches of flowers or greenery . I found the green vases at the Dollar Tree. They had beautiful mini vases in baby blue and white that I could of used instead but I loved these pink ones on sale from Micheals’ Spring collection. There are endless possibilities. You can choose to style your spring centerpiece with all different vases or with any combination that you like. 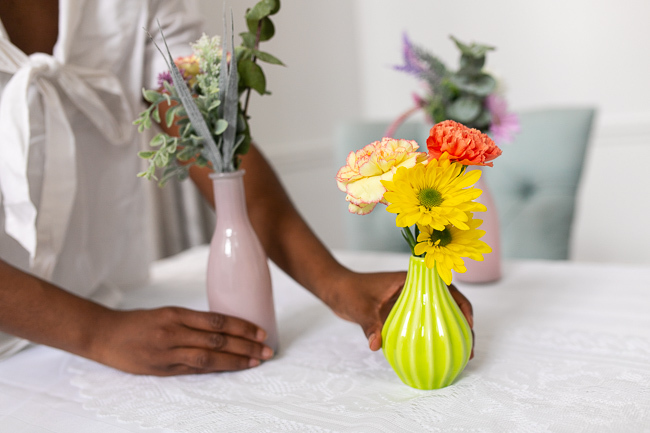 Hope you were inspired to bring spring into your home with this easy DIY spring centerpiece. Thanks for reading. Are you decorating for spring or Easter this year? Need inspiration for a Easter/ Spring table setting? 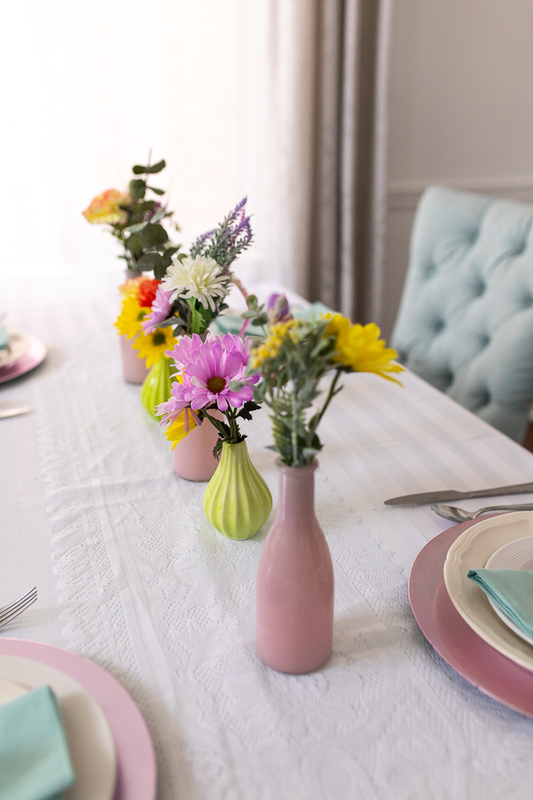 Check out 3 Easy DIY Easter Table setting ideas, You’ll Love!